So I went with black for the pie safe. Mainly because it is a safe (no pun intended) color choice for me. While I really loved the aqua colored pie safes, I thought it would be harder to display my lovelies in it. There are not many colors that can go well with aqua and I didn't want to be limited by what I could display in it (I'm a color geek like that.) On the other hand, black is a fairly neutral color and for the most part will set off whatever I choose to place inside the lovely pie safe. Rather than using a paint to refinish the pie safe I chose to use Minwax water based stain in Onyx. This stuff was so easy to use! After thoroughly sanding the piece to remove the varnish, I used Minwax water based Pre-stain Conditioner. This helps the stain absorb more evenly into the wood. I applied 2 coats of stain with a sponge brush. After letting it dry I finished it up with a coat of wipe-on poly. What I really loved about using the stain instead of a paint is that there are subtle hints of wood visible under the stain. I think it adds more depth to the piece and definitely more interest than a straight deep black. Now I'm just waiting for Mr. PD to get crackin on removing the door panels so I can finish those up. I'm also planning on painting the inside and off white color so that it will really show off anythign I put inside. Here it is in my dining room. It is still waiting for one more coat of poly, thus the plastic bags under the legs. I love your pie safe. It's an excellent an addition to the room. I love what you've done with the pie safe! I would love one of those baby's! 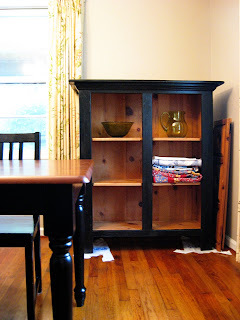 Yes, that really is a lovely cabinet, the black is wonderful, good move to use a stain and not a paint, here's a thought...might you consider not painting the inside the off while color? It is stunning the way it is here in your picture. The black and wood contrast are very compatible and delightful! Sure glad Jodi guided us to your blog today! oh looking so good! looks great in your room..
Jodie sent me over -- I've had a great time looking around. And I see you're in Crazymom's 9-patch-a-long -- me too! I love the black. I think that it looks good like it is, but will look even better painted white on the inside. ; ) You are one talented woman! Oh, I LOVE that! The choice to go with the black stain was a good one. It retains its antique lines, but looks updated and classic. I also like that you left the inside in a wood-tone. Just gorgeous! Great job. I've been wanting to try out the black stain - I really want to now. I love it! and I love how it looks with your table!